Moscow and Minsk continue to talk in louder tones. The company Uralkali has asked Russian authorities for assistance in achieving immediate cessation of politically motivated persecution of its employees by Belarusian officials, reads the statement of the company. Experts believe that this conflict between Moscow and Minsk over Uralkali will continue, but that it will not lead to a severance in relations. On Sept. 2, it was reported that Interpol had issued an international arrest warrant for Suleiman Kerimov, the co-owner of Uralkali. The Russian billionaire may be facing 10 years in prison. On Aug. 26, Vladislav Baumgertner, general director of Uralkali — which recently terminated its cooperation with the largest Belarusian enterprise, Belaruskali — was arrested at Minsk Airport. The Investigative Committee of Belarus accused Baumgertner of abuse of power and official authority, which carries a possible penalty of imprisonment for a term of 10 years. In addition, the State Control Committee of Belarus expressed its intent to seize property owned by structures affiliated with Uralkali. Political analysts believe that both Kerimov and Baumgertner have become hostages in the struggle between Moscow and Minsk for control over Belaruskali. It was right after Suleiman Kerimov became the largest shareholder of Uralkali that the company began its expansion and set its sights on Belaruskali. Alexander Lukashenko, the president of Belarus, promised to privatize Belarusian national assets, including this potash company. However, he demanded a high price — $30 billion. The transaction collapsed because of the inflated price. Industry experts have repeatedly pointed out that Lukashenko never actually wanted to lose control over Belaruskali, since this company is the largest source of foreign currency for the Belarusian state treasury. However, Moscow is interested in the creation of a giant company — an industry leader similar to Rosneft and Gazprom. Thus, Lukashenko spoiled the Kremlin’s plans, rather than the plans of Uralkali. Uralkali and Belaruskali began their cooperation within the joint venture Belarusskaya Kaliynaya Kompaniya (Belarusian Potash Company-BKK). In July, however, the Russian side announced a breach in relations. According to Uralkali, the Belarusians did not honor the agreement in regard to the export of fertilizers: All exports of Belaruskali should have gone through BKK, but the Belarusian company supposedly violated these terms. 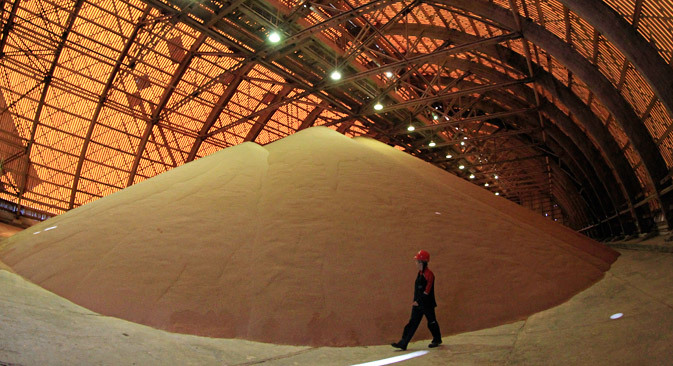 The breach in the relations between two such major players in the global potash market has led to its collapse. The world's industry leaders have lost much of their capitalization (10–15 percent), with Uralkali also suffering losses. Belarusian Prime Minister Mikhail Myasnikovich subsequently invited Baumgertner to negotiations concerning the existing situation. After the negotiations, which were held on Aug. 26 in Minsk, the Russian manager was arrested and imprisoned. Similar invitations from the Belarusian side were received by Kerimov and Alexander Voloshin, chairman of the board of directors of Uralkali; the two men were not able to go to Minsk because of busy schedules. “If he had gone, Kerimov could have easily met the same fate as Baumgertner,” says Alexei Makarkin, first vice president of the Center for Political Technologies. The political analyst believes that we can expect a response from Russia now. “Deputy Prime Minister Arkady Dvorkovich has already made some statements, saying that Moscow may issue international arrest warrants for certain people,” Makarkin says. The arrest of Baumgertner prompted a reaction on several fronts. The Russian Federal Consumer Rights Protection and Human Health Control Service has since claimed that Belarusian products imported into Russia do not meet safety requirements. In addition, Transneft has reported that it is going to cut oil supplies to Belarus by 400,000 tons, starting in September. “The decision to initiate criminal charges against Suleiman Kerimov was expected, and it was dictated by the logic of the conflict,” says political analyst Andrei Porotnikov, head of the analytical project Belarus Security Blog. So far, according to the Belarusian political analyst, Moscow's response to the actions of Minsk have been quite mild, and all statements from the Russian side have been routine. Porotnikov believes that Minsk has a chance to avoid serious complications in relations with Moscow. “There may be a number of harsh statements issued. However, whether it comes down to tough actions is an open question,” says the analyst. Makarkin believes that the point is neither Baumgertner nor Kerimov. “The point is Belaruskali, and that Lukashenko does not want to give up this asset,” says the expert. Moscow, according to the analyst, also is not interested in severing relations. “Eventually, Moscow and Minsk will come to an agreement — but they may ‘throw a few tantrums’ first,” Makarkin says. Suleiman Kerimov is a Russian businessman; he was born in 1966 in Derbent, Dagestan. He studied at Dagestan Polytechnic Institute (Construction Engineering Department) and Dagestan State University (Department of Economics). Since 2008, Kerimov has been a representative for the legislative body of the Republic of Dagestan in the Federation Council of the Federal Assembly of the Russian Federation. He is a member of the Federation Council Committee on Budget and Financial Markets. Kerimov controls the financial-industrial group Nafta-Moskva and the gold-producing company Polyus Gold. He is also the largest shareholder in Uralkali, as well the indirect owner of a large stake in the construction company PIK. In April 2013, Kerimov transferred the beneficial rights to his business assets to the charity fund Suleiman Kerimov Foundation. This foundation controls 21.75 percent of the shares of Uralkali, 36 percent of the PIK Group, as well as Polyus Gold International.